Pristine white virgin wool and jet black silk lapels combine to make this tailored blazer the ultimate indulgence from Marques' Almeida. Contrast buttons and flap pockets add definition and keep the look suave. 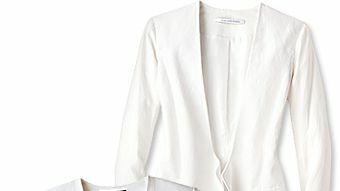 Precisely placed darts and stitches help to sculpt this Stella McCartney blazer with a flattering hourglass silhouette. Exude full-bodied Italian glamour in Dolce & Gabbana's "very dark blue" virgin wool blazer. Victoria Beckham keeps power dressing decidedly feminine with this chic peplum blazer.